Married Mary Greig (Crichton) on July 22nd, 1921 in Arbroath. I find would DEARLY LOVE TO KNOW MORE ABOUT HIM! My father died while my parents were living in Durham Street, Monifieth, while my father’s parents lived in Well Street, Monifieth. It says on their Marriage lines that Dad was a grinder. However, he joined a Highland Regiment at the outbreak of WW1 and I am really keen to find out which one, so that I can look up his Army Records and perhaps find out a little more about him. 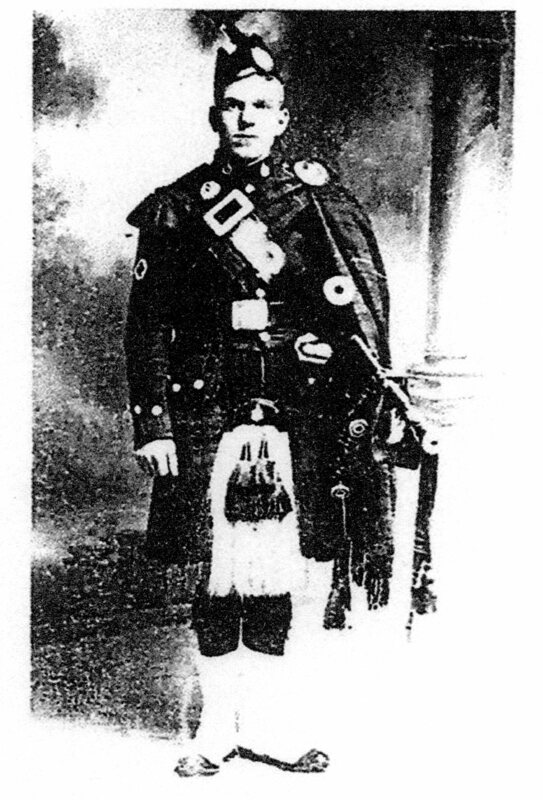 I DO know that he taught the bagpipes to the Boy’s Brigade in Monifieth. Mrs. Joan (Crichton) Bisset 31 Carnegie Street Arbroath. The past three weeks since our last meeting can only be described as being hectic. Our gallant remaining volunteers have managed to keep the doors of the House of Memories open against all odds ,on a regular basis. However it has been necessary to review the hours. Visitors have commented on their disappointment at the enforced closures. Our volunteers appeal has created interest and we have a few offers of committed support, which are currently under discussion. We need those hundreds who signed up offering support to honour their obligation. Invitations to deliver talks to groups & organisations continue, with the promise of donations for this service. We are currently working to assist the Librarian at Monifieth High School by lending material for a Monifieth in 1918 project. Angus Alive have also borrowed several items and using our researched information for their “Seven Towns , One County” exhibition in the Meffan Institute, Forfar. Our popular website is still attracting tourists to Monifieth. The warm dry summer ended last week and it was brought home with the drastic realisation that the current building housing the House of Memories memorabilia etc, is in urgent and desperate need of extensive structural repairs to keep it ‘wind and water tight’. This is something we have already brought to the attention of the leasing agents on numerous occasions, to no avail. From information received our Community Asset Transfer Lease Application for the vacant premises, formerly used as Angus Council Access Office /Police Station, would be given consideration at a full meeting of the Angus Council in the next few weeks. The future of the House of Memories and the services provided by Monifieth Local History Society are totally dependent on being granted the requested 3 to 4 years lease, and with volunteer support from members of the community to manage and support a Monifieth Community Heritage Centre. With a fourteen years of experience head start, we along with the members of Monifieth Community can do it.